Putting on an Oculus Rift headset is usually the highlight of E3 or CES, and this year was no exception. 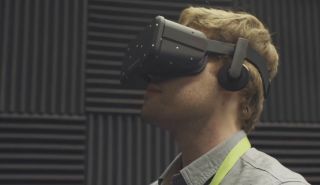 At CES 2015 Oculus showed the Crescent Bay prototype to the public for the first time. I got to try out Crescent Bay at the Oculus Connect event back in September, and not much has changed since then. Oculus has added positional audio to its demos since September, which is a nice touch. Crescent Bay is still incredible—read about my original take on experiencing VR presence for the first time to get a longer description of the latest hardware. Oculus VR didn't have any new information to share about a new developer's kit, or a consumer Rift, but we did talk to VP of Product Nate Mitchell about using the Crescent Bay standing vs. seated, what kind of controller options Oculus is working on, and their thoughts on Razer's new OSVR platform. That's all in the short interview above.